Starting in the mid 20th century, many book conservators and proto-conservators rallied around the now common premise that it is the material make-up and structure of books, and not just the surface decoration that needs to be studied and conserved. So it seems somewhat ironic that most of the recent research/ interest in 19th century cloth case bindings focuses on– you guessed it– surface decoration and famous designers. For those who think the structure of 19th century cloth case structures are all the same, I urge you to look again. They document the most radical change in book structure during the past 12 centuries. They dramatically evolve to become the ideal structure for fabrication by machinery. In fact, the machinery itself is of interest, beginning almost contemporaneously with the Luddite Rebellion of 1811-12. Interpreting how the machines evolved, were used, were maintained and affected labor is virtually unresearched. I fear many of these machines gone- sold for scrap. Similarly, a friend of mine recalled seeing mountains of smashed linotype machines left for trash in the 1970’s along the West Side Highway in NYC. 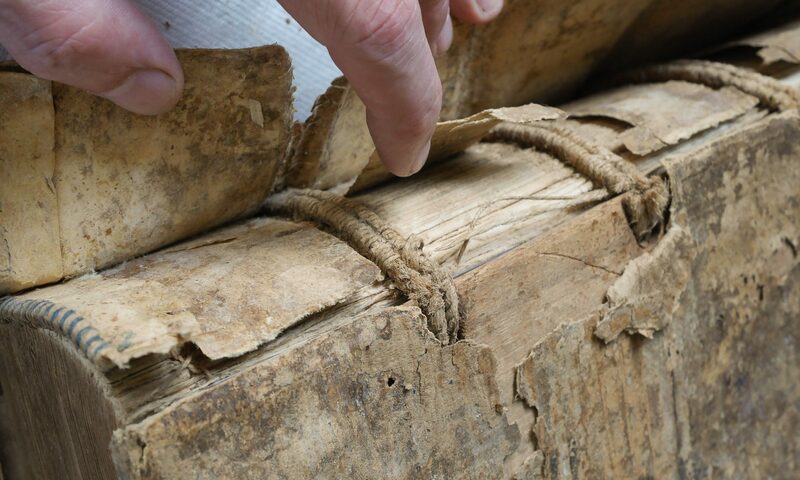 The structure of cloth cased books, and boarded books, preceded mechanization and was originally done by hand. Around 1820, the only machine used in cloth binding was a rolling machine to replace hand beaters, but by the 1880’s about the only operation done by hand was the final casing in. I almost always find it interesting to look at machines, speculating about how they functioned and appreciating their aesthetics. In some respects, the Espresso Book Machine could be considered the quintessence of bookbinding machines. It can print, bind, cover and trim a “library quality paperback” in about 4 minutes, with humans only needed to clear the occasional paper jam in the high speed printer. Now we just need a reading machine to replace the outdated human interface…. But we’ll need even more conservators to put the books back together when the adhesive fails, don’tcha know. Oh – yeah – right. Duh.